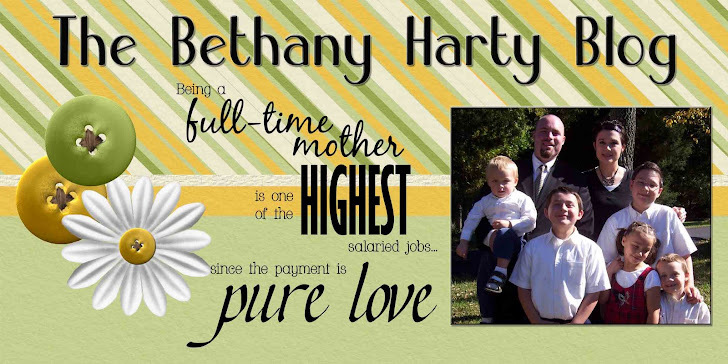 The Bethany Harty Blog: I'm Still Here! Hi all. I'm writing from Brent's office. Actually, it's his staff persons office. We couldn't get his computer hooked up to the internet. My kids are roaming the scout office. Nice, eh? We're all settled in the cabin in the wood. I actually like it. When we buy a house, I want a deck with a picnic table on it to feed the kids at. Such easy clean up. The kids started school on Tuesday. Jacob and Tom love it. They have great teachers, and are making new friends. School is 30-35 mintues away. Still haven't worked out the bus thing yet. The bus stop is 15-20 mintues away, and come at 6:25. Maybe I'll just take them in. We can leave at 7:10 to get there on time. More sleep for us all. Eme and Joe start school next week. Joe gets to go all day, for Tuesdays and Thrusdays, for $30 a months. Not too bad. Eme has all day every day kindergarten. She's totally excited. We went today to get them all signed up. Tomorrow we sign up for WIC, and Friday is Open house for K and P-K. Tonight is Cub Scouts, which is a lot of fun. We get to go to the church pack again. So nice. Yeah, you're back...sort of! ha. Talk to ya soon. . cant wait for those pics to start rolling in again. Good to hear you are getting into somewhat of a routine. That is a great price for Joe's school and I am glad the big kids like school too! I found some pix of you guys from Baker. I will scan them when I have some time and email them to you. Tell everyone I said hi and well miss you all.